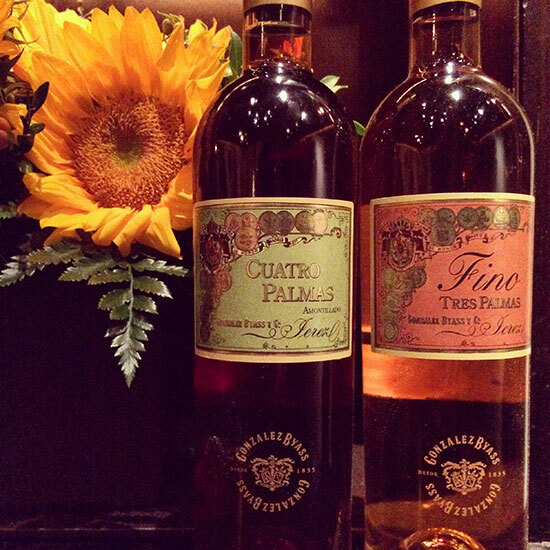 Gonzalez-Byass's Palmas series of rare sherries are some of the greatest wines of Spain, or anywhere. b) Some sort of vaguely appealing, dry-tangy, not-exactly-wine served in little glasses in tapas bars that you kind of recall having at one point, maybe. c) One of the world's great wines. If you ever taste the rare Palmas sherries from Gonzalez Byass, you’ll answer C.
Gonzalez Byass is one of the largest sherry houses, and its Tio Pepe fino sherry is one of the best deals out there in the world of wine (and yes, it’s drily tangy and often served as an aperitif at tapas bars). But the Palmas sherries are of another order entirely. This series of four sherries, released yearly, are chosen from individual casks among the company vast soleras—the Byass bodega houses more than 22,000 casks of sherry, so there are quite a few to choose from. Though the wines are finos, like Tio Pepe, they’ve been allowed to age anywhere from six to 45 years, allowing the thin film of yeast on top of the surface of the wine (the flor) to work its odd magic on the sherry’s flavors and aromas for far, far longer than usual. Of this year’s releases, the Gonzalez Byass Una Palma ($34) starts from a selection of 150 barrels that’s winnowed down to three; light gold in hue, with yeasty and nut skin scents, it has a rich texture and an almost peppery bite. With the Dos Palmas ($45), aged eight years, the yeasty flor notes turn smokier, with a lemon-rind note; it’s chalkier and more mineral, and more concentrated. The Tres Palmas ($74) was my favorite of the four in this release. A ten-year-old fino, “it’s from a tiny section of one of our soleras, that still has a patchy veil of flor covering it,” says Vicky Gonzalez-Gordon, whose family founded Gonzalez Byass in 1835. “It really pushes fino to its limits.” An orange-gold sherry with caramel, flor and grapefruit rind scents, and an olivey, earthy tanginess to its flavor, it’s both elegant and powerful, a remarkable sherry. Finally, the miniscule-production Quatro Palmas ($115) comes from a single cask in the tiny “museum solera” at Gonzalez Byass, and is 48 years old before it’s bottled. Dark reddish-amber, it smells of caramel, wood and tangerine rind. It’s a truly intense wine: tinglingly acidic, very dry, with vivid flavors that almost overwhelm the palate. These are very limited wines, but they're worth searching out. And if some TV-watching grandma tasted any of them? She’d probably levitate to the ceiling while hollering “Hallelujah!” in four languages. Seriously. Sherry does that kind of thing, when it's really, really good.